As you all know, I shop at Walmart quite a bit. I love the store for their great prices and high quality selection of pet products, in particular treats. Well on recent trips, I’ve seen big displays of a new product called No Grainers. They certainly caught my attention with the bright blue packaging and healthy message. So when the people at No Grainers sent me a sample of their 100% Grain Free dog treats, I couldn’t wait to try them. Well, lucky for me my friend Tony moved in just a block away. He has a 4-year-old beautiful Doberman. During the move she was very anxious and acclimating to the new apartment very stressful. 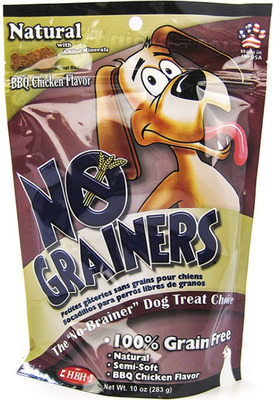 I brought over a 7 oz bag of No Grainers Hickory Smoked Pork Flavor dog treats and some raw hide and pigs ears. I thought it would keep her busy while Tony and I moved boxes. Let me tell you, I was surprised when Senta, the Doberman wanted more No Grainers treats preferring them to the raw hide. They must be good, and must be tasty. Because I don’t know what could be more delicious to a dog than a smoked pigs ear. So, not only do I recommend No Grainers for their taste, and the fact that they are high in protein, they are healthy too.